VIP LOT is #5A - for concerts you need a special ticket or VIP pass stamped VIP PARKING or PREMIER PARKING. This lot is desirable because it has a separate exit out to the Wantagh State Parkway. The main lot #5 you will experience a delay leaving the venue, due to the design of Jones Beach State Park this lot always experiences a bottleneck with only one exit onto the Ocean Parkway. Be prepared for standstill traffic leaving this lot. CONCERTS usually end around 10:30 to 11PM, there's a midnight curfew at this State Park. No overnight parking allowed. ♫ Ample Special Needs / Handicap parking is available at the venue. For concerts, guests should follow the roadway signs on Bay Parkway(east) and use their Special Needs tag to enter the VIP/Special needs lot. The parking lot is designated as lot 5A inside the Jones Beach State park. Special Needs parking is based upon availability. Jones Beach Theater will make every effort to accommodate guests should special needs parking not be available. The VIP/Special Needs lot is controlled by New York State Park Police and is operated by our VIP staff during performances. 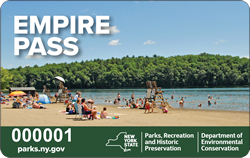 Your key to all-season enjoyment at New York State parks is the Empire Passport, providing unlimited day use vehicle entry to most of New York's State parks and recreational facilities for just $80! Enjoy the forests, the seashore, the lakefronts in your state parks...every day if you like, through all of New York State's beautiful seasons. Walk, picnic, bike...bring as many friends as your car holds! The Passport provides access to most of the 176 state parks, 55 Department of Environmental Conservation (DEC) forest preserve areas, as well as to boat launch sites, arboretums and park preserves. Available for only $80, the Passport can be used from April 1 to March 31 of the following year and pays for itself in 8 visits. This may be used on a boat, motorcycle or a second passenger vehicle. Please follow the link below to download the print version of the Empire Passport Application in Adobe PDF Format. Please review the following rules to ensure uninterrupted use of your Empire Passport. The 2018 Empire Passport is valid now through March 31 2019. There is no discount if it is purchased in later months. It is not transferable and non-refundable. Access is allowed for the decaled or pass holder . The Empire Passport does not guarantee vehicle entry into the park. Camping, golf, museum, historic site admission and other special activity fees are not included. The Empire Passport is usable for passenger vehicles or any vehicle the holder is in. The Empire Passport may be used while the holder is visiting the facility. The Empire Passport may be permanently affixed as described below. It will be accepted if it's been altered in any way or is adhered with tape. Boats - inside of hull in a protected, but visible area when the boat is the primary vehicle which would otherwise incur a fee to enter the facility. For boat launch sites the Empire Passport must be affixed to the vehicle towing the boat. Clear protective covers for permanently affixing Empire Passports to motorcycles or boats without windshields are available free of charge upon request. The decal, or its fragments or scrapings (whenever possible, but always for a vehicle that has been sold or a leased vehicle that has been returned). Leased and rental car users must affix the Empire Passport and may obtain a free replacement as described above. 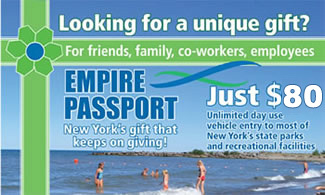 The Empire Passport is valid even if not permanently affixed to a window on the vehicle’s driver's side.